Heather Padilla began writing in 2008 and has publications in "The Physician and Sportsmedicine" and "The Digest of the Journal of the American Dietetics Association" to name a few. She holds a Bachelor of Science in health sciences from Baylor University and a Master of Science in medical nutrition science from Boston University School of Medicine. Fish oil has long been praised for its positive effect on various cardiovascular disease components, such as blood pressure and lipid lowering. There is also evidence that it may improve symptoms of mood-disorders, such as depression and bipolar disorder. Lesser known though is that fish oil may actually help to regulate sleep patterns and increase quality of sleep. The reasons behind such claims involve the relationship of fatty acids in the production of various hormones and neurotransmitters. According to Lawerence Epstein, M.D. of Harvard Medical School and the Division of Sleep Medicine at Brigham and Women's Hospital, one in five Americans sleep less than six hours a night. While there are various reasons for sleeplessness ranging from pain and stress to disorders like insomnia, sleep apnea, and narcolepsy, many adverse consequences can result apart from simply not being able to function at full potential throughout the day. Sleep deprivation is associated with numerous negative health implications such as heart disease, diabetes, depression, and obesity over time because insufficient sleep often leads to lack of exercise and healthy eating. A diet low in the types of fatty acids easily obtained through fish oil can interfere with the production of normal physiological chemicals. Fish oil is high in the Omega-3 fatty acids eicosapentaenoic acid -- EPA -- and docosahexaenoic acid -- DHA -- and can be obtained directly from fatty fish or from supplements. A 2008 study in the Journal of Nutrition conducted by M. Lavialle and colleagues suggests that a diet deficient in Omega-3 fatty acids lessens the melatonin rhythm, weakens the circadian clock functioning, and has a part in nocturnal sleep disturbances. Fish oil plays a role in enhancing the secretion of melatonin, according to studies in the American Journal of Clinical Nutrition. Melatonin is a hormone which helps to regulate sleep and wake cycles and is often used to treat insomnia and jet lag. Fish oil components EPA and DHA have also been shown to lower norepinephrine levels. Norepinephrine is a stress hormone associated with the fight-or-flight response and works to increase heart rate among other things. It is also one of the major neurotransmitters associated with sleep - the other being serotonin. Norepinephrine is a necessary component of the sleep cycle as it is responsible for the Rapid Eye Movement or REM stage. An imbalance of norepinephrine can negatively affect sleep patterns and lead to daytime drowsiness. According to the World Health Organization, people should consume 0.3 to 0.5 grams of daily EPA and DHA. This equates to at least two servings -- 3.5 ounces -- per week of fatty fish such as salmon, halibut, canned tuna, bluefish, herring, pollock and catfish. 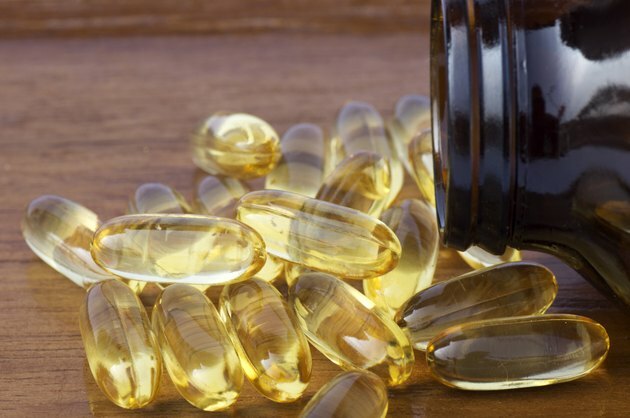 The average 1,000 milligrams of fish oil capsule contains a ratio of 180 milligrams EPA and 120 milligrams DHA, therefore one to two capsules per day is the recommended amount. An n-3 polyunsaturated fatty acid-deficient diet disturbs daily locomotor activity, melatonin rhythm, and striatal dopamine in Syrian hamsters.